MPs should be given a free vote on whether to accept or reject the final Brexit deal, Sir John Major has said. The ex-prime minister argues that MPs must vote with their "own conscience" on whether the deal on offer will leave the UK better or worse off. And, in a speech in London, he said they could decide on a new referendum. Leading Tory backbencher and Brexit backer, Jacob Rees-Mogg, said Sir John had been wrong on Europe in the past "and he is getting it wrong again". "We had a democratic vote, the decision has been taken and what he is trying to do is overturn that," he told BBC News. 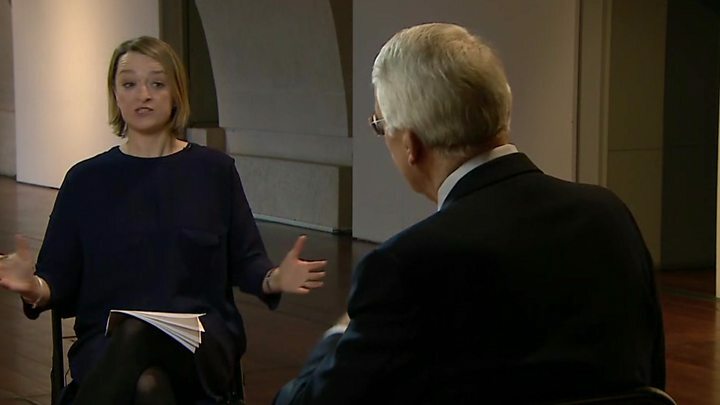 Speaking to the BBC's political editor Laura Kuenssberg, Sir John insisted he was not "targeting" Theresa May and he genuinely wished her well in getting the best deal for Britain. But he said some of the advice she was getting from within her own party was "very unwelcome from the point of view of the wellbeing of the country". Sir John, whose time as Conservative prime minister from 1990 to 1997 featured long-running battles with Eurosceptics in his party, has long been a critic of the UK's decision to leave the EU, having campaigned alongside David Cameron on the Remain side in the 2016 referendum. 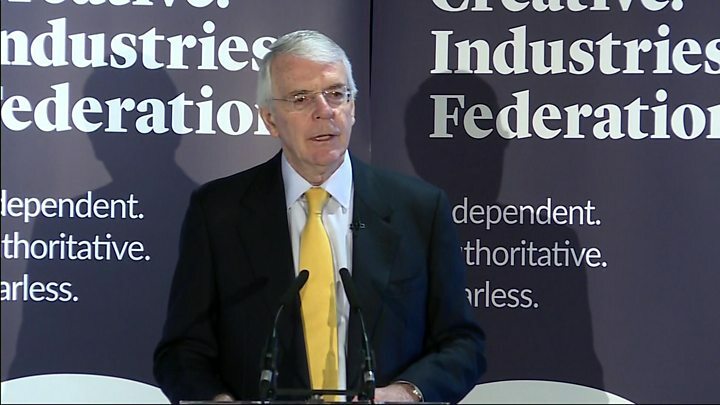 Brexit has become the most "divisive" political issue of his lifetime, he said in the speech to the Creative Industries Federation. He said the promises made by Leave campaigners during the referendum had yet to be met and were unlikely to be, describing the aspiration to spend an extra £350m a week on the NHS as a "ridiculous phantom". "Many electors know they were misled: Many more are beginning to realise it. So, the electorate has every right to reconsider their decision." Sir John challenged what he said was the argument Brexit would have little impact on the UK, arguing that while the British people would "get through it", it was likely to leave the country "weaker and less prosperous" and a "diminished" force on the world stage. Given the emerging evidence that Brexit will "hurt most those who have the least", he said the government must "change course" and rethink its negotiating strategy, based on what was practically achievable rather than what he said were the demands of a "minority of ultra-Brexiteers". While he did not enjoy being "out of step" with his party, the stakes were so high than he felt obliged to speak out at such a crucial moment in the negotiations. "Leaving Europe is an issue so far-reaching, so permanent, so over-arching that it will have an impact on all our lives - most especially on the young and the future," he said. "With only 12 months to go, we need answers, not aspirations." While he was not actively calling for a further referendum, he said the "option" must remain open to a "sovereign" Parliament to insist upon. The "meaningful" vote promised by Theresa May on the final agreement must be "a decisive vote, in which Parliament can accept or reject the final outcome; or send the negotiators back to seek improvements; or order a referendum so the public may approve what has been determined". "Brexit is a unique decision," he added. "It will affect the lives of the British nation for generations to come. If it flops - there will be the most terrible backlash. "If Brexit is whipped through Parliament, at a time when the public are so divided about it, voters will know who to blame if they end up poorer and weaker. So, both democracy and prudence suggest a free vote. "The deep divisions in our nation are more likely to be healed by a Brexit freely approved by Parliament, than a Brexit forced through Parliament at the behest of a minority of convinced opponents of Europe." Speaking to the BBC's political editor Laura Kuenssberg after the speech, he insisted he was not "targeting" Theresa May and he genuinely wished her well in securing her aims. 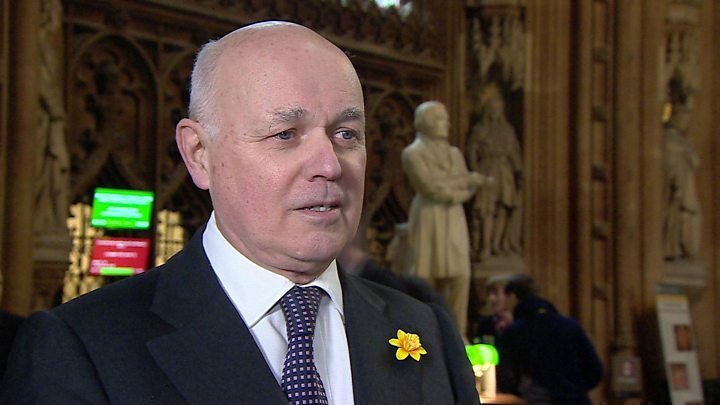 Former Conservative leader Iain Duncan Smith said the idea of another referendum was "rather absurd". "We have to leave because the British people have said we should leave and we have to make the arrangements we can," he said. "We have had a referendum, they have spoken and I think that is enough." Mr Rees-Mogg suggested the former PM was talking "complete humbug" over the issue as rather than permitting free votes during the Maastricht battles of the early 1990s, Eurosceptic rebels were subject to the "most aggressive" form of whipping, with many being effectively thrown out of the party. "You would expect John Major, a former prime minister, to make a statesmanlike speech, free of propaganda and cheap comments, when in fact, it's all cheap comments and propaganda," he said. "This isn't a statesmanlike speech, this is one of somebody grubbing around in the weeds for weak arguments and it's a very poor speech in that regard."